Salam! Iran is experiencing a boom in travel these days. Although there are so many false prejudices, the country surprises visitors with a huge variety of stunning nature, culture and architecture. 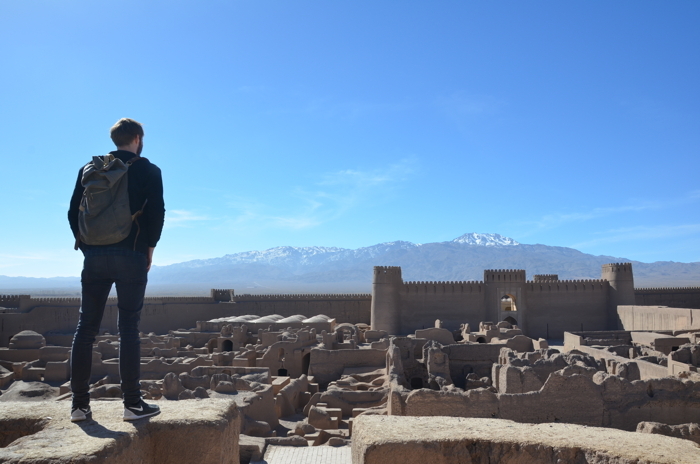 After two trips to various regions of the country, from the Caspian Sea to the Persian Gulf, I’ve now compiled this handy guide to Backpacking Iran. You can enter the country overland via Turkey, either on the old Orient Express route by train or even by motorcycle or bicycle. But from Europe, the easiest way to get to Iran is still by plane, for example with Turkish Airlines (via IST), Austrian Airlines (via VIE), Emirates (vie DXB), Alitalia (via FCO), Pegasus Airlines, Iran Air or Germania. Most flights go to Tehran (IKA), but now there are also direct flights to other parts of the country. Backpacking Iran: Most tourists arrive in Tehran at Imam Khomeini Airport. The Imam Khomeini International Airport (IKA) is located 30 kilometres southwest of Tehran and is the largest airport in the capital. As a subway line to the city centre is planned but not built yet, it is advisable to take a taxi. The new fixed rate is IRR 500,000, which is about 17 euros, 12 GBP or 18 USD. Payment is possible only in Rial or US dollars. The Mehrabad International Airport (THR) is closer to the city. Here, however, hardly any international flights are handled. A taxi costs about 8 euros depending on the destination. The infrastructure in Iran is good. In addition to a good rail network, there are some excellent connections in partially comfortable buses and also cheap domestic flights. Backpacking Iran: The old buses are still in use. 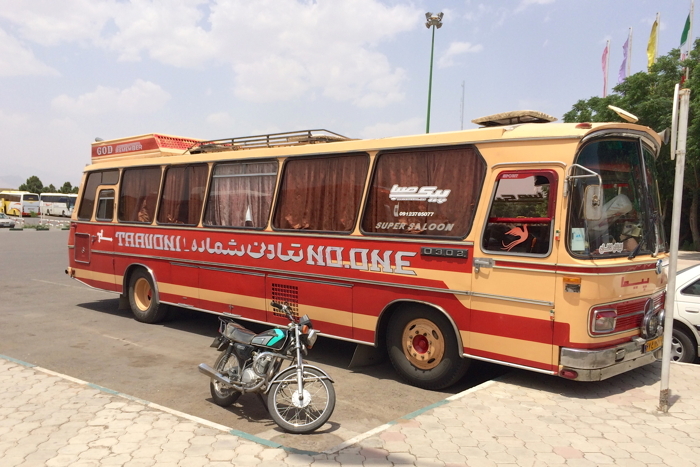 Backpacking Iran: By bus from Tehran to Kashan. By bus: There are many domestic bus routes. Some of the buses are even better than those of most European bus operators. The so-called VIP buses have about as wide and comfortable seats, like in a good airlines business class. On long haul they are therefore a real alternative to the domestic airlines, which are not necessarily the safest ones (e.g. Iran Air, Mahan Air, Caspian Airlines). 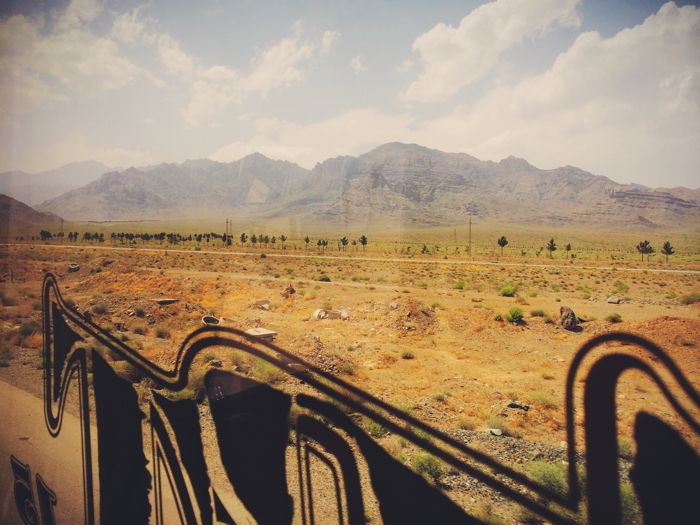 By train: Between the larger cities such as Shiraz, Tehran or Isfahan there are also rail links that I have never tried. Nevertheless they are considered as a good alternative to the long-distance buses. 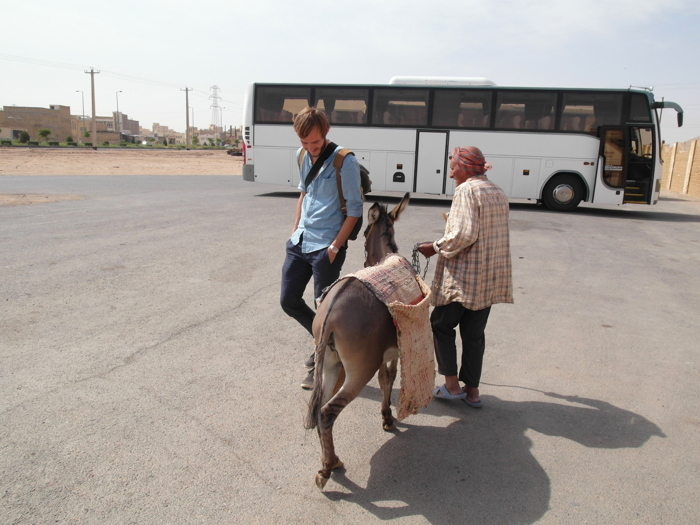 Backpacking Iran: Bus or donkey? I’m not sure. By domestic flight: There is a well-developed flight route network in Iran. Flights are cheap (e.g. Shiraz to Tehran costs about 40 euros one way) and prices are regulated by the government, so there are no significant price fluctuations between airlines. The best part is that you get refunded the full fare up to 24 hours before flight departure, if you decide not to use the ticket. However, often only in the travel agency where you originally booked the flight. By car: Please just forget the idea of driving a car in Iran. The traffic is fatal. If you are not en route to India with your own car and have to pass Iran anyway, just don’t do it. By metro: In Tehran, there are several lines of a quite modern subway, which is a great alternative to a taxi, especially in the endless rush hour. The metro has separate compartments for women. For tours or backpacking Iran: the Iran visa is issued for a specific length of stay. Getting a visa for Iran can take you two to three weeks. As rules change from time to time, please check with a consulate in your country (if it has one). Who needs an Iranian visa? There is visa on arrival for passport-holders from half-a-dozen countries. If you are not a resident of one of these, the best thing to do is to arrange a visa in advance or take the risk of applying for a 15-day visa on arrival at the airport in Iran. It’s possible for US Americans to get an Iran Visa. But you are not allowed to do backpacking in Iran. On the contrary, you need to pre-arrange a private guide or a tour operator, or be sponsored by a friend or relative in Iran who will take legal responsibility for you. Israeli passport holders as well as anyone with an Israeli stamp in their passport will not get a visa. Although I know one German traveler who got the Iran visa with an Israeli stamp in her passport. The tourist visa is the best option. It is issued for up to 30 days, but extendable (valid for 90 days.) You have to get this visa before traveling to Iran. Tourist visa on arrival (VOA) is issued to people from 65 countries for a max. 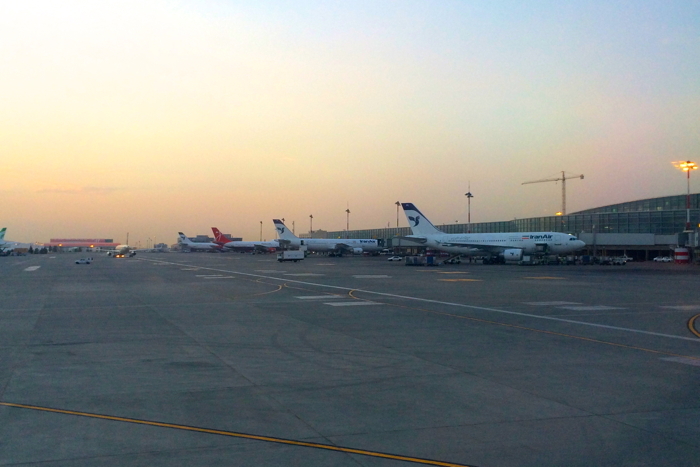 of 15 days on arrival at any Iranian international airport but only with an onward air ticket. This still seems to be risky, although I haven’t heard of someone lately who was denied entry. The VOA is available for example for most European, ASEAN, countries in the Persian Gulf Region, Central Asian countries, some South American countries, China, Australia, Japan, India, New Zealand or South Korea. Transit visa is another option. If you are en route to another country, you can get an Iranian transit visa for a max. of 7 days. This option is only available for non-US passport holders. After deciding for a visa type you can get the visa yourself or pay an agency. In every major city you can find at least two hotels, which are well prepared for backpackers and independent travellers. Staying in these often traditional houses is mostly affordable. Reservations can be made either through the hotel’s website or via phone. 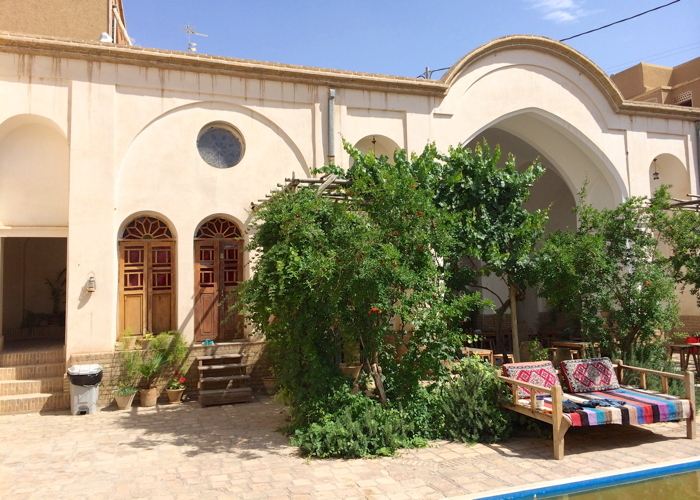 Backpacking Iran: This is what a traditional guesthouse looks like. 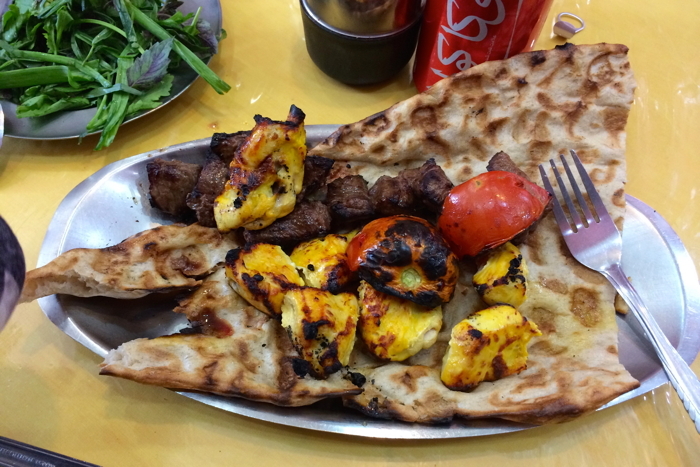 Besides the fact that one can find lots of cheap fast food like pizza and burgers in bigger cities, the Iranian cuisine offers some real highlights. For example, Dizi, a traditional lamb based stew with beans, chickpeas, potatoes, tomatoes, onions, turmeric and dried limes. No backpacking Iran without the national dish: Kabab with steamed rice. 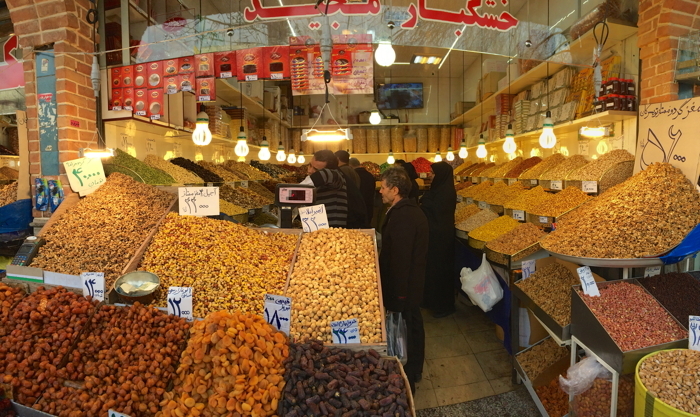 When backpacking Iran you will enjoy delicious dates, figs and nuts on the bazaar in Tehran. But the Iranian national dish is Tschelo Kabab – steamed rice with grilled lamb or beef on a skewer that is usually enjoyed with a Dugh, the Persian version of the Turkish drink Ayran. 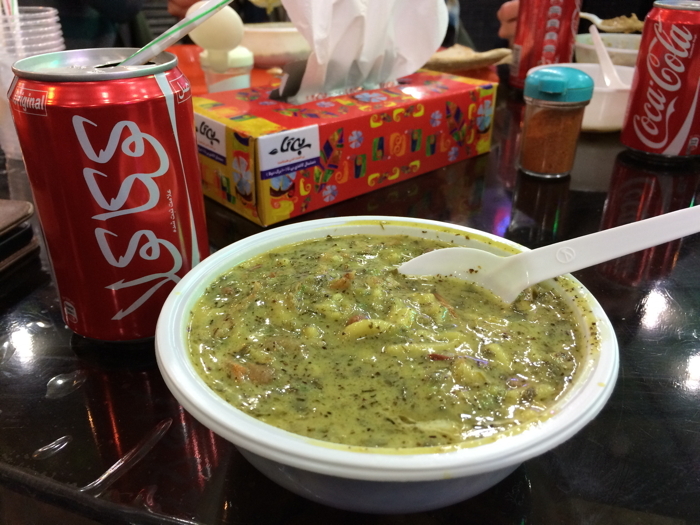 I also found Ash (or asch) very yummy, a thick soup of noodles, lentils, beans, vegetables, mint, onions and yogurt. Tip: Good restaurants are often located on the 1st floor or in the basement. So it is always worth keeping your eyes open. The best restaurants are mostly small, inconspicuous, where the boys serve the guests while mom prepares the meal for decades. A delicious experiences when backpacking Ian: Ash, a thick soup of noodles, lentils & beans. 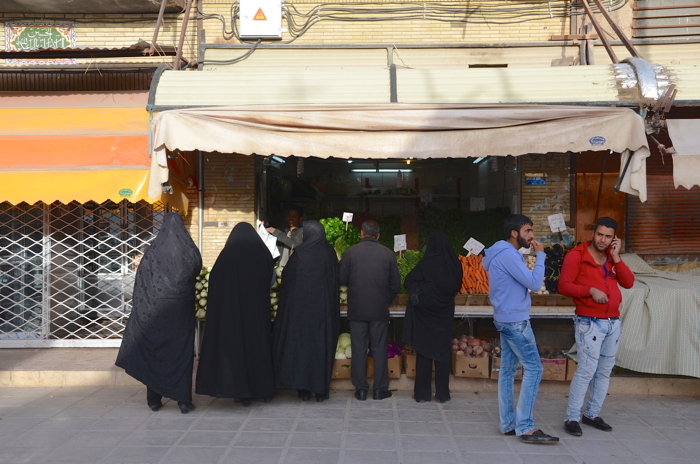 Vegetarians in Iran: Don’t worry, because many young Persians are vegetarians, too. There are usually a few dishes to choose from. If not, it is common to ask before ordering it, if they could just leave out the meat. Drinks: Tap water is drinkable in many places, but often with very high mineral content. In summer there are free water dispensers. The best alternative everywhere in Iran, of course, is always a tea – coffee is rather unusual. Alcohol in Iran: Alcohol is strictly forbidden and as a tourist, it is better to stay away from weird procurement methods. It is also forbidden to bring alcohol to Iran. For Germans and some other passport holders, it’s easy to travel individually and on your own in Iran. Travel in Iran for Americans is only allowed in the form of a well-organized group tour and not in the form of backpacking Iran. Individual tours are completely denied. Since February 2014 British and Canadian citizens must also be a part of a tour or travel with a privately hired guide. Backpacking Iran feels like being the Prince of Persia. As a man that’s no problem. As a woman… Well, everyone needs to decide for herself. Indeed, also foreign women in Iran must adopt specific rules like wearing a headscarf the entire time and covering the body with loose clothing. Maybe you will be able to meet other solo travellers in hotels with whom you could travel on together at some point. I personally believe that Iran, as compared to some countries of the Arab world for example, is relatively harmless in terms of sexual assault. Eventually every individual must decide for herself, how to behave in certain situations, whether it is necessary to walk into this dark street all alone, or whether it might be too late to take a walk around the block. Simply try to listen to your instinct. Although CouchSurfing in Iran is very popular, it is officially prohibited. If you might have a try anyway when backpacking Iran, it’s an affordable alternative to hotels. If you don’t need a proper tour guide and want more freedom of decision instead, traveling individually should be the better option. However, in my opinion both backpacking Iran and group tours have their raison d’être. In Iran, no international credit cards, debit cards and travellers checks are accepted. Visa and MasterCard do not work because these are American companies that are subjected to the penalties. Bring money in cash – euros or US dollars – for any expenditure on round trips or while backpacking Iran. Then you can change cash to Rial on arrival at the airport, at exchange offices or in major hotels on the daily rate. You will have millions of Rial when backpacking Iran. And there is something else that you have get used to: the Rial itself. 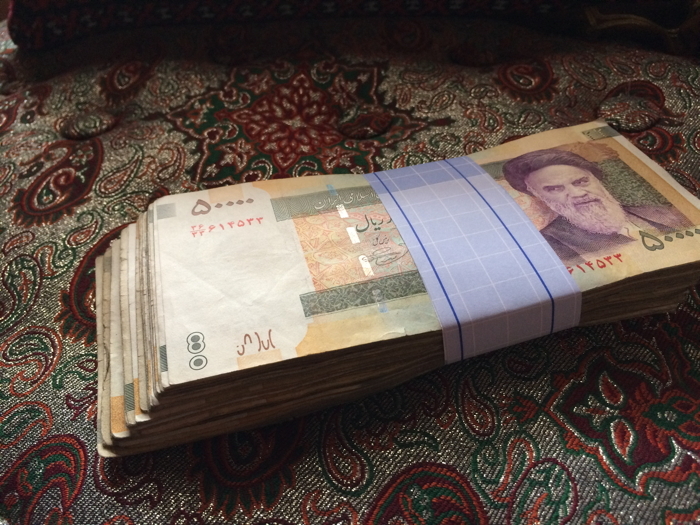 The currency in Iran has not only tens of zeros (300,000 Rials are about 10 euros/7 GBP/11 USD), so that you can quickly become a millionaire, there is also a fake currency that is called Tuman or Toman. You won’t find it on any coin or bill, but in the people’s language. How it works: The Tuman is just a tenth of the Rial price. So don’t be surprised if the lunch occurs cheaper than it might be. The trick is adding an imaginary zero to get the right amount in Rial. Most prices are in Tuman, because that is the market price, both in stores and on the bazaar. Here it should be mentioned that there no Persian has ever cheated me these zero, although he had the chance to do so. It would be so easy to rip off tourists with this. Many hotels also accept US dollars and euros. But you mostly get away cheaper with local currency. All tourists must adhere to the Islamic dress code. To make it short: women may show no hair and legs, and generally do not wear form-fitting clothing. The feet must be hidden with opaque stockings. No one has to completely disguise himself in Iran, also when backpacking Iran. In fact, many young women in Iran know how to dress individually and stylish and always find a little escape from the rules, like a bright pink headscarf instead of the staid black or by wearing it kind of loose on the bun. Fashion is a statement. And for some, rebellion begins with a little step, especially in Iran. 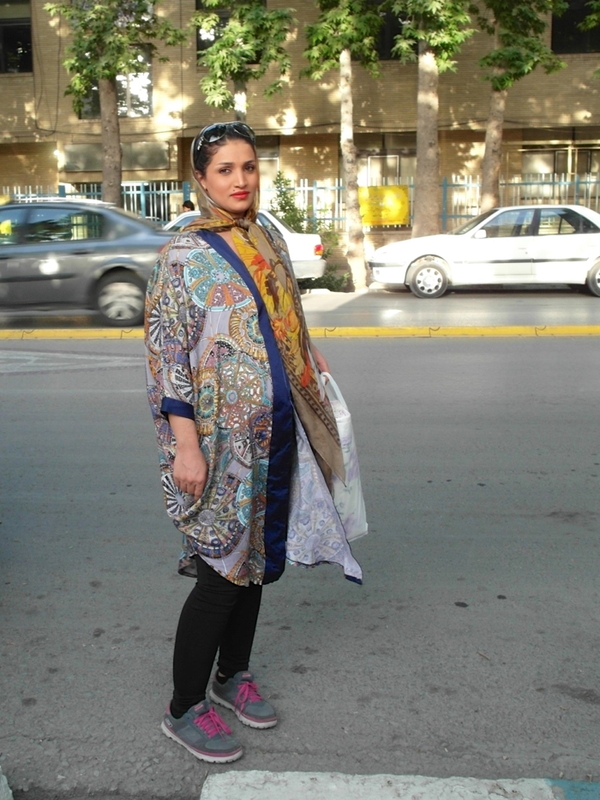 When backpacking Iran one will see many well dressed ladies. There is a “Morality Police” in bigger Iranian cities, but they concentrate more on young Iranians than tourists. The only thing that could happen to you is that someone gives you a subtle hint on the street. You can always play the tourist card. 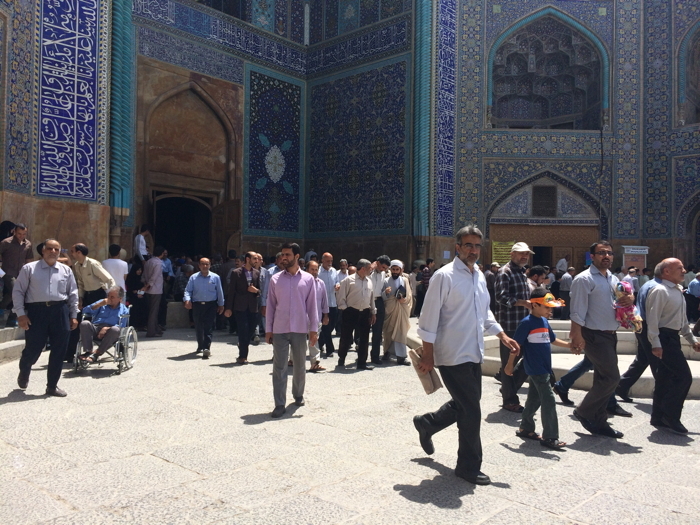 Backpacking Iran: The Scheich Lotfollah Moschee in Isfahan. In fact, men also have to adhere to the dress code when backpacking Iran: no shorts, tank tops or short T-shirts. Almost everything we think we know about Iran is the work of overzealous Western journalists. In Iran, no woman has to wear a burka, Iranians are no terrorists, not everyone has nuclear weapons in the basement and the Islamic Republic does not mean Islamic State. Iranians do not hate America. While backpacking Iran you will soon notice that the issue of security in the country is overstated from many sides. I felt safer in Iran than in so many dark corners of European cities. And I know more stories of travellers who were victim of theft in Italy or brutally robbed in Argentina. But not in Iran. On the contrary, according to an annually updated Risk Map, the Iran ranks higher in the internal security for tourists than some usual tourist destinations. However, you should try to avoid the unstable border regions to Afghanistan, Pakistan and Iraq. Since the election of moderate President Hassan Rouhani in 2013 international connections are also better and national rules have even been improved a bit. However, it does not hurt to report your own arrival in advance at your embassy, if they offer that possibility. The German Embassy for example has a form on its site. Photography and filming: This is also critical. In and round many public buildings photography is strictly prohibited and may result in having to delete the photo in front of a policeman. If you want to take photos of the locals, please be ask. Iran is a medium-priced travel destination, depending of course on your own way to travel. In my opinion one can do backpacking Iran at 25 euros a day. The most expensive part is the hotels depending on your choice. Entrance fees: € 2-3. UNESCO World Heritage Sites such as Arc-e Bam, Persepolis or the Golestan Palace in Tehran cost btw. 6 and 10 euros. Despite all the media reports, travellers to Old Persia will recognize one thing very fast: the open, courteous and hospitable people of Iran. I have never met so many nice people in any other country. I was never more often invited to tea or a meal, was taken to a private city tour or a tour of the bazaar so many times. Backpacking Iran: You will make best friends on the road. The Iranians know about the bad reputation of their country and do everything they can to oppose their kindness. The phrase “Welcome to Iran” still echoes in my ears whenever someone said it to me on the road with an incredibly honest euphoria. This kindness is anything else but fake. Persians are also very polite and respectful to each other. As a good Persian friend once said: Iran is a country of four seasons. In fact, in January I first survived a snowball fight at the Caspian Sea and two days later stood in the Dasht-e Kavir desert at 30 degrees feeding some camels. True story! 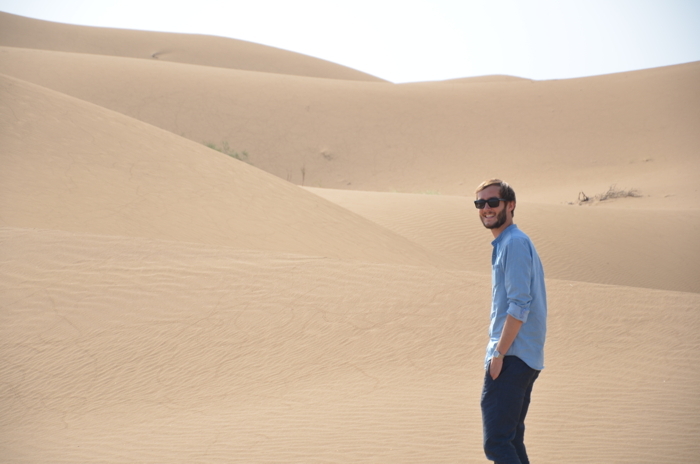 Backpacking Iran: Only 2 days between desert and snow. The best time to visit Iran depends on what you want to do. Skiing in the Elburz Mountains is only possible in winter, while in the central Iranian deserts it can get incredibly hot with over 70 degrees in summer. If there is something like a best time to travel to Iran, then that would be from March to May and September to November. 13. Internet in Iran – Facebook, Google and Co. Yes, there is Internet in Iran and almost every hotel has Wi-Fi, although often very slow. Some sites like Facebook and Twitter are completely blocked (Instagram & WhatsApp are not.) The same is true for the apps that just show an error message in Iran. Backpacking information Iran: For websites like Facebook & Twitter you need VPN or the Open Door App. For everyone who does not want to give up certain news portals and social media sites, I can recommend the browser Open Door for smartphones & tablet. It allows access to all Internet sites. For laptops using a VPN server is recommended, but I honestly had no good experiences. Also as a European, you don’t need an adapter, as the European plug (Euro plug) fits into the sockets. For others you will, of course, need an adapter. Iranians are generally well educated. 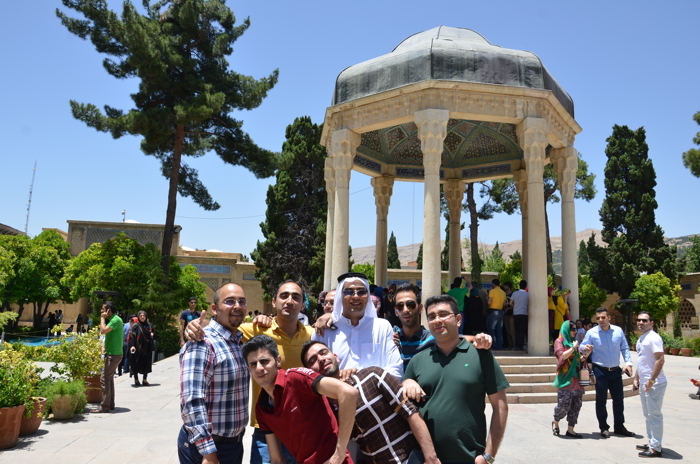 So many young Persians also speak relatively good English and the really love to talk to tourists. If languages are not your forté all you need to start in Farsi is this: Salam (Hi), Baleh (Yes), Kheyr (No) Lotfan (Please) and Beh salomaty (Cheers). These couple of words are a pretty good start. The Persians will be so happy for every single word in Farsi that you try to use. It is also useful to remember the spelling of the numbers from 0-10, so you can read the price on your receipt or ticket. 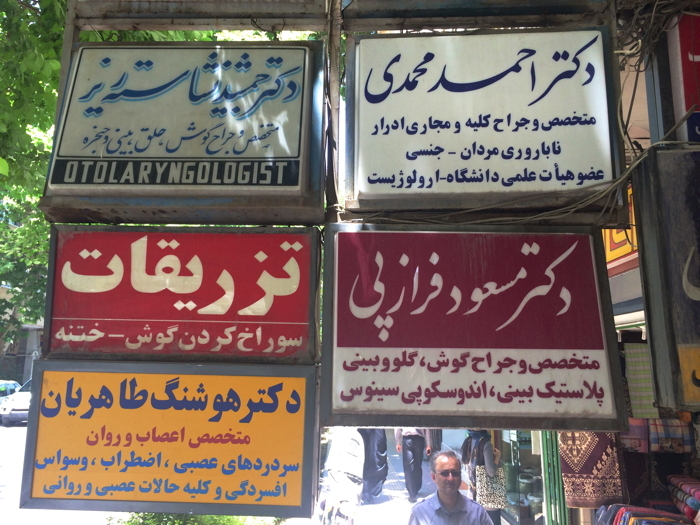 Backpacking Iran: lost in translation in in Isfahan.